This Holder for iPad Suits Many Environments. With a Sleek Black Finish, This Modern Display is Ideal for Residential and Commercial Use. This Holder for iPad is Ready to Ship! 360 Degree rotation allows for portrait or landscape viewing orientation. 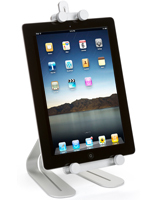 Adjustable arms allow this display to hold iPad1, iPad2, iPad3, iPad 4, iPad Air and 10" tablets. Black finish on a silicone mount and steel base suits many environments. Cable management hole for easy charging while on the stand. 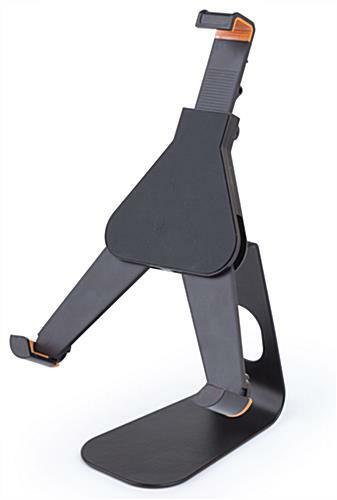 This holder for ipad that is made of steel and plastic is durable and affordable. These accessories are a sleek counter top stands with many great features. 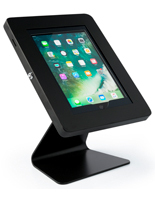 This desktop Apple® tablet display, holder for ipad that has a black finish is sleek to suit many environments. 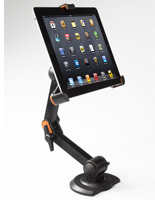 Users can operate an electronic tablet while utilizing this hands free mount. 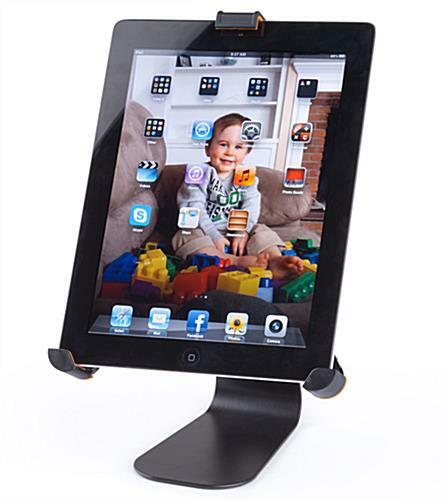 This holder for ipad that can display a tablet in portrait or landscape has 360 degree rotation capability. 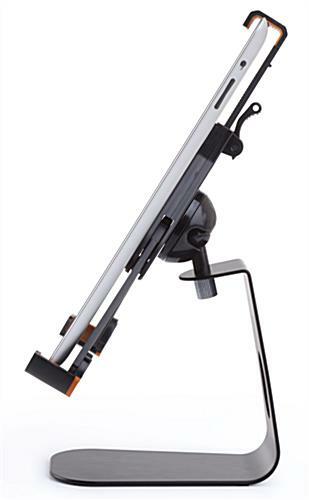 The top leg is height adjustable to allow for devices ranging from 7"-10". Apple® accessories, such as this holder for iPad, has many adjustments to suit the individual user. This versatile tablet mount is ideal for residential use but can also be used in retail stores when combined with our Kensington glue-on locking kit (sold separately). Soft silicone corners help prevent scratching on this holder for iPad. Constructed of a steel base and silicone plastic mount, this display is meant for long term use. This holder for iPad has rotating legs that range from 36° to 180°. Users can charge the tablet while in use through the unique design of this table stand. 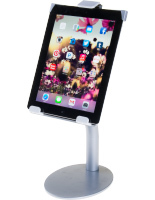 This tabletop holder for iPad, also known as a countertop stand, suits generation 1, 2, 3, 4 & Air Apple® tablets. These tablet mounts are functional countertop stands. 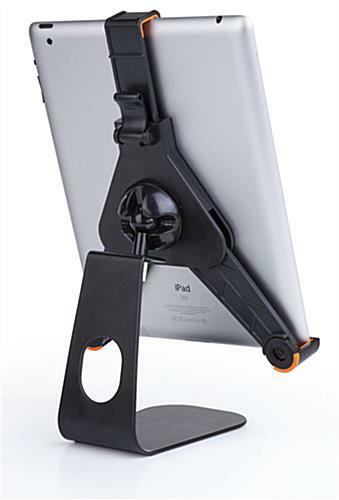 This rotating holder for ipad allows users to adjust to the ideal viewing angle with ease. 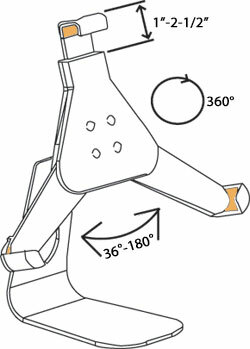 The 360° rotation can be done while the tablet is still mounted in place. This function allows for ease of use when switching from one activity to the next which requires a different orientation. 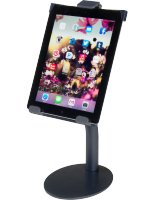 This desktop mount is a convenient place to keep any Apple® tablet. This display twists side to side 90° as well as 135° backwards from a vertical position. These desktop stands are affordable and ideal for displaying tablets. This desktop display has silicone feet for securely holding a tablet without scratching the surface.